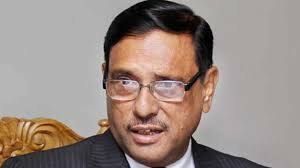 Road Transport and Bridges Minister Obaidul Quader on Thursday said BNP is now lobbying with European Union (EU) and the United States for making the recently held general election controversial, after being rejected by the countrymen. “The democratic world was not confused by BNP’s propaganda. So, the world community recognised the new government,” he told the reporters after attending a meeting of Dhaka Transport Coordination Authority (DTCA) in city’s Nagar Bhaban. Quader, also the general secretary of Awami League, said the foreigners have no allegation against the polls held on December 30 as well as the countrymen have no reaction to this end. Terming the BNP’s demand of holding fresh polls as ridicules, the minister said they (BNP) need to go to parliament for the survival of their existence. “I hope that they will join parliament shunning negative politics and will make constructive criticisms,” he added. The ruling party leader said the behaviour of the leaders of Jatiya Oikya Front has proved that the unity will not be exist for long though they are saying that their unity remains intact. Urging the elected lawmakers of BNP and Gano Forum to join parliament, Quader said the Gano Forum lawmakers are in pressure to join in the House. They will take oath after getting pressure from their voters, he added. He said the upcoming local government elections will be held in a free, fair and transparent manner. He urged BNP to take part in the polls. The meeting decided not to allow holding any rally in the capital except on holidays. Besides, the minister asked the authority concerned to take necessary steps to stop horning by in front of schools and hospitals.